We’ve spotted a couple of nice Bluetooth speaker deals this morning. These compact options are perfect for stocking stuffers, dorm rooms or kitchens. There are a variety of color options as well to find the right match for your setup. 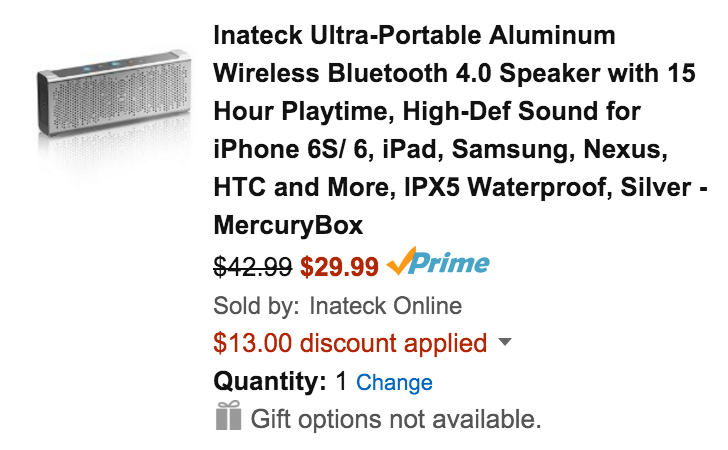 Inateck Online via Amazon offers its Aluminum Bluetooth 4.0 Speaker in Black or Silver for $42.99. Applying coupon code MLCSPHJL drops the final price to $29.99 with free shipping for Prime members (free trial) or on orders of $35+. That’s good for $70 off the original price, $13 less than the regular going rate, $7 better than our previous mention and the lowest current offering we can find. 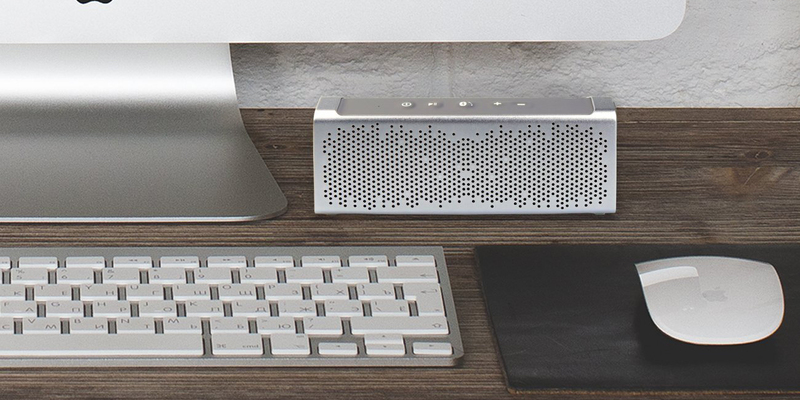 This aluminum speaker features Bluetooth 4.0 connectivity, dual 5W speakers, a built-in 1,800mAh battery and a microphone for hands-free calling. Users can expect up to 15 hours of playback on a single charge. Rated 4.4/5 stars by over 286 Amazon customers. 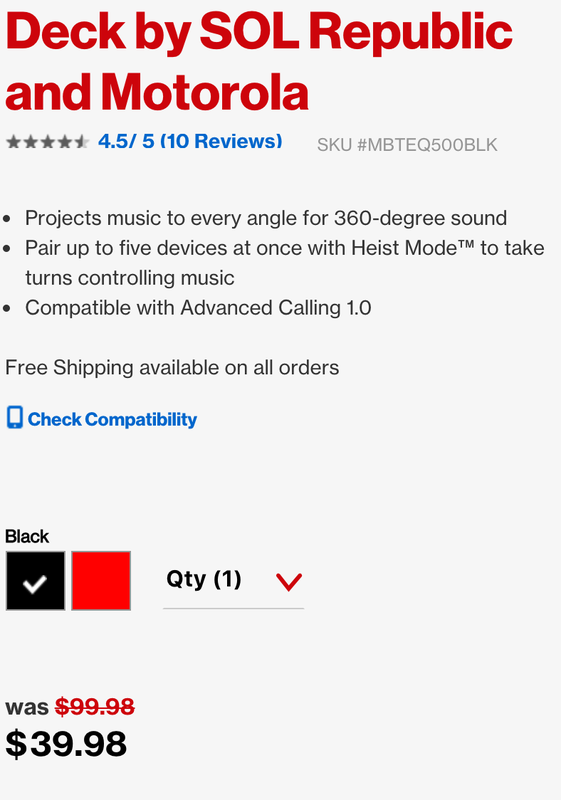 Next, Verizon Wireless has the Deck by SOL Republic Bluetooth Speaker in Black or Red for $39.98 shipped. This is a savings of $60 off the original MSRP, $10 better than Amazon, a match of our previous mention and the lowest current offering we can find. We typically only see this speaker drop to this price point in yellow, so today’s deal is more notable. Features include R2 Sound engines with a built-in bass port for “bigger sound”, NFC or Bluetooth pairing, speakerphone capabilities and support for five devices simultaneously. 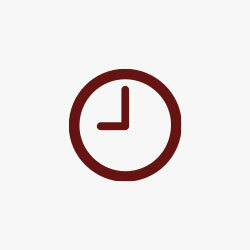 SOL Republic states that a typical charge lasts around six hours. Rated 4.4/5 stars. If you’re looking for something a little more cost-effective, we also has the DBPower Waterproof Sports Bluetooth Speaker for $10 Prime shipped when coupon code FSC9CT55 is applied during checkout at Amazon. As part of the Gold Box Deals of the Day, Amazon offers the OontZ Angle 3 Ultra Portable Bluetooth Speaker for only $19.99 Prime shipped. Portable Bluetooth speakers are one of the easiest and most cost-efficient ways to wirelessly stream your favorite music, podcasts, and internet radio from any smartphone, tablet, or laptop. These compact speakers include a built-in rechargeable battery that can usually produce room-filling sound for several hours.